Free Weekend Tips : Squad – Communicate. Coordinate. Conquer. A free weekend is upon us! (June 21 through June 24) New and returning players alike might be able to use a headstart on Squad to make their weekend more enjoyable. A quick reminder before we dive in: Squad is an Early Access title, which means you’re going to experience some rough edges while you play and the game still has some significant systems coming before release! How do I spawn into my first game? 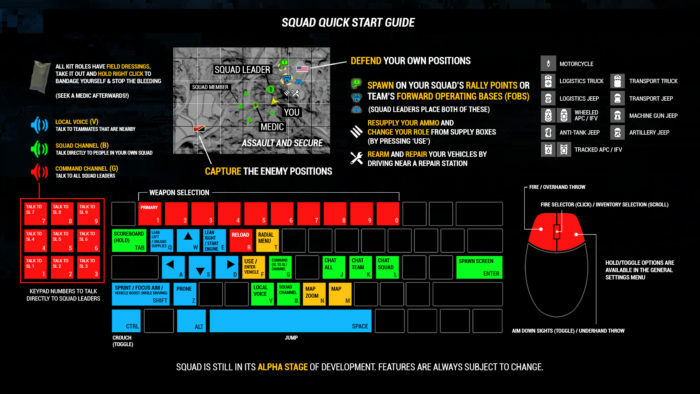 Once you’ve joined a server from the server browser, hit your Enter key to bring up the spawn and squad selection menu, join a squad, ask your squad leader what kit the squad needs and choose your role/kit from the kit selection menu. Then pick a safe place to spawn with your squad or wait a little for further instructions or the placement of another spawn point for your squad. Is there a quick way to get started? You might also want to jump into the Shooting Range once you have Squad installed. It’ll let you familiarize yourself with controls, the environment, weapons, and vehicles youll need to succeed in Squad, on your own terms. There are some helpful admin commands, like AdminAllKitsAvailable, that can make exploring a little easier. Some players have reported positive results by disabling Texture Streaming in Settings once the game has fully loaded. Squad crashed after about 30 minutes. Check to see if youre running any Razer software, such as Cortex or Synapse. Disabling this should allow you to play without crashes. Some users have reported updating to a beta version of the Synapse software has also helped. Not all networks are created equal, but there should be an easy fix. In Steam -> Settings -> In Game options, set “In-Game Server Browser: Max Pings/minute” to 500. You should have reliable access to servers now! Should you encounter any issues with EAC during your weekend, repairing/reinstalling your EAC files should clear it up pretty dang quick. For help with that, check out the illustrated guide here. We get it, some files have to earn your trust. This will verify your trusted system files and replace any corrupted/altered system files that may be causing you a headache. Smart thinking, squaddie. You are obviously going places! We’d recommend this guide by SgtHerhi. It has all the information you need to deploy fully prepared. A similar guide illustrated guide can be found here. The Squad Wiki is also a good point of reference and there’s no substitute for asking your fellow players! First, thanks for reporting it! There are a couple ways to do it: you can check this thread for directions, or join the Community Discord server and navigate to #bug-reports.